If there is something working parents worry about its their kids day care. You can instill their confidence by handing out these 2x3.5 custom day care center business card magnets 20 Mil round corners during the next tradeshow, community event or street festivals. We are sure that most of your recipients will retain it for reference for themselves or for sharing it with their dear ones having young kids. Order today to get started with these custom printed magnets at the earliest! Bring sMiles on faces of your customers by handing out these personalized school magnets at the earliest. 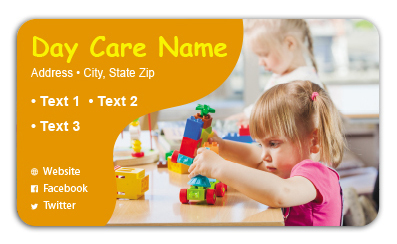 Request a quote to know what you may save on bulk orders of these 2x3.5 personalized day care center business card magnets 20 Mil round corners.